Marines have lots of reasons to be proud. Marines have indestructible wills. They are set apart by their training and its intensity, their high standards, a unique culture, a long and proud history. 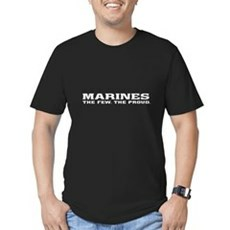 We've got an awesome collection of Marines The Few The Proud T-shirtss, hoodies, gifts and more. We specialize in Marines The Few The Proud T-shirtss and many more funny, vintage and retro t-shirts. Shop political, conservative, anti-war, pro-liberty and activist t-shirts, clothing and gifts. All orders come with a 30 day money-back guarantee and most ship within 24 hours.